I read this article and found it very interesting, thought it might be something for you. The article is called Poor, Rich, Middle-Class: All For Kejriwal and is located at https://archive.indiaspend.com/cover-story/poor-rich-middle-class-all-for-kejriwal-99059. Delhi’s vast underclass—more than 60% earn less than Rs 13,500 per month—was always expected to back Arvind Kejriwal and his Aam Aadmi Party (AAP). But the great surprise has been how middle-class and upper-class areas too voted for the upstart party. The vote share of the AAP has climbed 25% over 2013, indicating widespread support across income and class groups. The BJP’s vote share fell by a little more than 1%, but India’s first-past-the-post system, caused a loss of 29 seats over 2013. The AAP’s triumph has been at the expense of both principal rivals, with Congress votes appearing to have been transferred to the newbie party en masse. Prime Minister Narendra Modi’s popularity wave, evident even in Maharashtra and Jammu and Kashmir assembly elections until a few months ago, appears to have lost momentum. 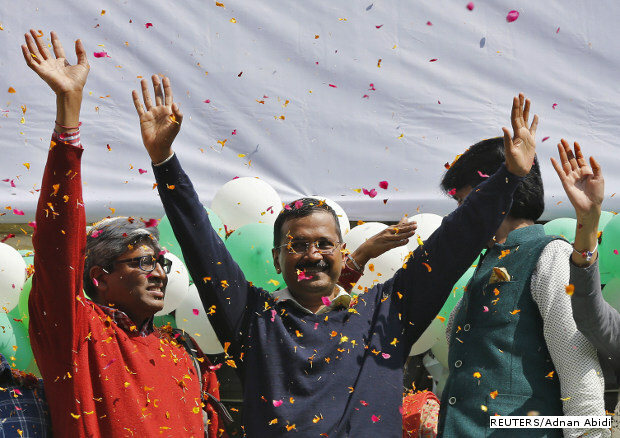 AAP has won 67 of 70 seats; far higher than most exit polls had predicted. The party will win more seats than any party ever has in Delhi. Thus far, the Congress had the highest number ever, in 1998: 52 seats. A bit of rewind: the 2013 Delhi elections ended in a hung assembly. While the Bharatiya Janata Party (BJP) was the single largest party, the AAP formed the government, ironically with the support of their biggest opponent Congress. IndiaSpend had earlier analysed how BJP managed to get a major chunk of the AAP vote share in the national elections. Now, it has been a reversal of fortunes for the parties. In terms of vote share, AAP has 54%, again higher than any party has had in the past two assemblies. The BJP’s vote share for 2015 is 32%. The BJP has only lost about 1 % of its vote share, maintaining its loyal core. The AAP government is not short of challenges to start work on immediately after it takes oath at the Ram Lila Maidan on February 14th. A new love story is set to begin with AAP ki Dilli. Update: Figures have been modified to reflect latest Election commission numbers.